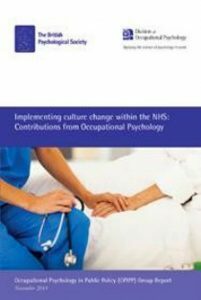 The practical steps required to implement culture change in the NHS is the subject of a new report launched today, Thursday 6th November 2014, by the British Psychological Society’s (BPS) Division of Occupational Psychology (DOP). The report, ‘NHS Culture Change: Contributions from Occupational Psychology’, presents a series of essays by leading Occupational Psychologists, each drawing on evidence and expertise from the science of people at work to address the question of how successful culture change, as recommended by the Francis Report and subsequent Berwick Review, can be implemented within the NHS. It has been compiled by the DOP working group Occupational Psychology in Public Policy (OPIPP). The essays take as a starting point the fact that to facilitate excellent patient care, staff wellbeing and empowerment must be prioritised. Appropriate work design and support for staff welfare such as Schwartz Centre Rounds are recommended, along with a greater focus on collective leadership and the need to ensure psychological safety of staff members when building a culture of transparency and openness. Topics discussed in the report include ‘Work design for compassionate care and patient safety’, ‘Leadership: Directing culture change and enabling staff wellbeing’ and ‘Building cultures of transparency and openness’. The launch will include short presentations from leading academics, including BPS Fellow Michael West, Professor of Work and Organisational Psychology at Lancaster University Management School and Emeritus Professor at Aston University.